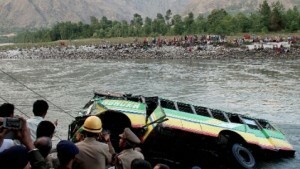 At least 33 passengers were killed on Wednesday when an overloaded private bus plunged into the Beas river. The incident took place on the national highway in the northern Indian state of Himachal Pradesh. Thirty three bodies have been recovered and 15 injured persons were rescued and rushed to hospital, while some bodies are feared to have been swept away in the river, a government official in the city of Kullu, Sharab Negi, said. The bus driver jumped out of the vehicle before it plunged into the river, Negi said. Search parties have been deployed to trace the missing.